The leprechaun or fairy has long been associated with Ireland. At one time every souvenir shop would be stocked with rows of these plaster cast figures dipicting small men wearing red peaked hats, sitting on a toad stool. Visitors would be pleased to see the Gaelic script underneath “Deanta san Seapan”, confirming its Irish origin – it actually translated “Made in Japan”. Even today, if you take a coach tour on the Ring of Kerry you will see a sign on the road-side at Ladies View which reads ´Leprechaun Crossing´ and will more that likely be informed by your courier that down below on the islands of Killarney´s Upper Lake is the last place in Ireland where you will find leprechauns. Is it true? Well as the great story teller, Tim Lynch, says “Well, if it isn’t true, it should be”! There are in fact very sound reasons why leprechauns are still a topic of conversation in Ireland of the 21st century. While the commercial aspects of ´the little people´ can be seen as a bit of fun, their origins are part of a folklore tradition that dates back over 2,500 years and is the richest folklore found in Europe. During the 1940´s and 1950´s a band of men and women travelled the length and breath of Ireland recording the folklore of the country. They visited isolated cottages along the west coast, local schools and village pubs. Over cups of tea and pints of stout they recorded a library of folklore that is a monument to their dedication. 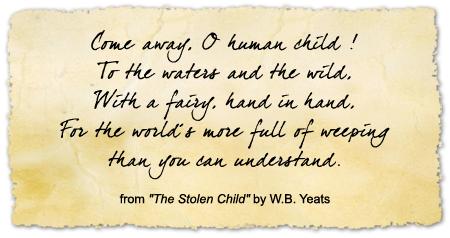 What is it about Irish folklore that is so special? Why is it, according to some Irish historians, more vibrant, alive and more exciting than the Greek and Roman classics? The answer lies in a combination of factors, rather than any one individual influence that moulds Irish folklore. The most important ingredients are history, tradition, language and value. 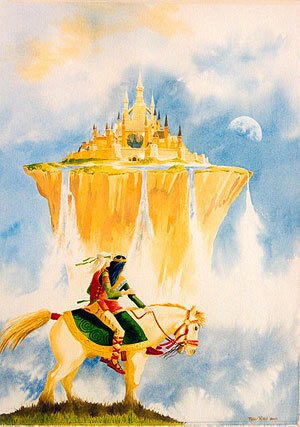 Folklore and legends are usually myths based on some credible facts and beliefs. When the Celts arrived in Ireland about 600 B.C. they brought with them the corner stone of Irish folklore. They arrived in a land of magnificent forests, streams with abundance of salmon and many fine archaeological remains from earlier invaders, such as the passage grave of Newgrange and the many dolmens and megalithic tombs – a land ideally suited to Celtic culture and beliefs. The Celts believed these sites were inhabitated by the spirits of the Tuatha De Danann, the people of the Celtic goddess Danu. Magic forces filled the lives and surroundings of the Celts. Animals and sometimes human sacrifices were offered to please the gods or to seek their assistance in battle or plea for a successful harvest. Dagda was the chief god and others had specific roles, such as Morrigan, a powerful warrior goddess and Lug the fertility god. The gods lived in Tír na nÓg, a land of eternal youth far out at sea. Places were also sacred, such as woods, rivers and wells. In fact, their beliefs were very similar to those held by North American Indians or the tribes of the rain forests. Read more about the people of Ireland. As the Celts had adapted the sites of the early invaders, Christianity did likewise when it arrived in the 4th century A.D.. The cross of the new religion was a combination of the Christian cross and the Celtic sun-god symbol – thus giving the famous Celtic crosses. Ogham stones, inscribed standing stones, were named after the Celtic god of writing. Rather than disguarding these, the Early Christain church adapted the stones and encouraged people to ´Christianise´ them with inscribed crosses. To this day people visit the stone fort in the hills above Rathmore outside Killarney on the 1st of May each year. This coinsides with the pagan feast of Bealtaine. The people walk around the fort reciting prayers and insribing a cross on a stone flag as they go. This site is also believed to hold curing powers for cattle – a custom that dates back over 2,500 years. The water wells which were so special to the Celts now became holy wells, St Michael´s Well, St Mary´s Well, St Margaret´s Well – here also you will find the cross inscribed stones. St Patrick himself capitalised on the Celtic ideology and is commonly portrayed holding up the shamrock which he used to explain the Blessed Trinity – three persons, one God. Language is also very important in preserving a country´s folklore. The Irish language is of Celtic origin and dates back to their invasion. Today the language is still alive and with it the old sayings, songs, stories and customs. Even Gaelic place names that we take for granted can be very significant in terms of folklore. If we look at some place names in Kerry, for example Ballaghisheen which is derived from the Gaelic Ballagh Oisin, meaning the mountain pass of Oisin, a major figure in Irish folklore. Similarly, Da Chich Anand in Rathmore are named after Anu, the great goddess mother of the Tuatha De Danaan. Language is a powerful link with the past. The story of Tir na nOg told in Gaelic today would be reasonably similar in content and language to the story heard by children in the Celtic era. The survival of Irish folklore is largely dependent on the people. Certainly the fact that Ireland has such an extensive history is important, as is the native language and surviving customs and traditions. However the real longing to preserve what is Irish and avoid the European Union ´melting pot´ must come from within the people. Ireland in the 21st century has seen a marvelous revival of the Irish language, Irish music, dance and national pride. This pride also extends to an excellent economic performance and achievements in sport. Folklore is important in the make up of people. Appreciating the past is important in preparing for the future.